Here we are…the second-to-last issue of the entirety of this (as we’re in 2015 I have to use the word "original" to specify) Age of Apocalypse story. The issue opens with Bishop in the hands of the Madri as they prepare to "sacrifice" him so that his knowledge does not pass further and inspire others to consider a world in which Apocalypse does not presently rule. Storm bursts onto the scene and frees him, though the doing drains her considerably. While this is going on, Quicksilver and Banshee locate the source of the Madri–Jamie Madrox–as we learn that the Madri are all "just" dupes of Jamie. Meanwhile, Rogue and her group arrive back at the mansion to learn Magneto has been taken and her son Charles is missing. Nightcrawler bamfs in with Destiny; Colossus and Kitty had also arrived with Illyana and now deliver the news that their students died in freeing the girl. Dazzler and Exodus return as well, Gambit and Lila Cheney in tow…but no sign of Charles. Rogue lashes out at Gambit for not returning with her child; while Banshee sacrifices himself to put an end to Abyss, and Madrox gives his own life to shut down the Madri and thus save Storm and Bishop. The various pieces of Magneto’s planning have come together, borne fruit…and the X-Men stand ready to end the age of Apocalypse. Though this issue does technically continue threads from the previous issue, in many ways it feels more like a filler issue, not belonging to its own series, but rather, tying things together to funnel/filter several things into X-Men: Omega and the end of the overall AoA story arc. There’s a lot going on, though nothing really gets much focus. The story as such doesn’t work as a solo issue, and even as a final issue, too much "space" is given to converging plotlines for this to really fit the standard expectation of a final issue. I suppose I’d say that this issue lacks much of its own identity as a chapter of an individual thread about to be woven back into a larger whole. Yet, this certainly sets things up and if one reads this issue, it certainly does not make much sense not to continue on to X-Men: Omega. The art is good. Nothing really stands out positive or negative, though if anything it might be the portrayal of Abyss. I can’t quite figure out if I like or dislike the character’s appearance…though it’s a credit to the visual team that I can "hear" the sound of the character’s movements in my head. This issue is a sort of bridge between the other minis and X-Men: Omega; particularly Generation Next, X-Calibre, Astonishing X-Men, and Gambit and the X-Ternals…really only leaving out Weapon X, X-Man, and Factor-X, as those series’ finales I believe are more directly connected to the pages of the bookend special. The end of this issue points out the continuation into X-Men: Omega…which apparently was on sale the same week, so there would have been the double-dose of story, and making this one functionally an extension if one bought both. X-Men: Alpha, 8 4-issue series, two 2-issue series and a profile book…this is–if my math’s correct–the 39th part of AoA, with everything wrapping up in a 40th issue, capping things off. 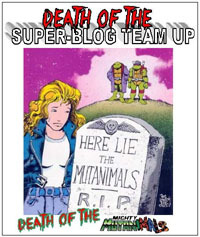 We open with Magneto at Xavier’s gravestone, reflecting on the past and significance of Xavier and his life. Bishop interrupts and we learn the two are out on the grounds of the mansion due to a perimeter alarm, and before long the two are attacked…first by Infinites, then Apocalypse himself. 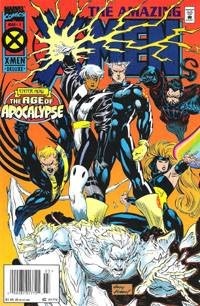 The two fall to Apocalypse…leaving the grounds empty when Storm and Quicksilver’s group returns. They split to seek Magneto as well as his son Charles, but find only evidence that Nanny defended Charles, and Magneto did not leave of his own volition. While Quicksilver confronts Angel–who is "in the know" with this sort of thing–we see Bishop being probed for info by the Shadow King, and then Abyss arrives. Meanwhile, having gotten what info he needed from Angel, Quicksilver prepares the group to retrieve Bishop, recognizing that Bishop is key to Magneto’s plans, moreso than Magneto himself. This cover, and this issue in general–is one of the ones I remember and think of when I think of the Age of Apocalypse story in general. I remember the physical battle between Magneto and Apocalypse, and apparently have–at least subconsciously–been looking forward to this, despite not recalling for certain where stuff went down. I hadn’t remembered much detail on the X-Men and their searching for Magneto or how they connected the dots, but as I read this, that was almost "extra" after the battle between the two Big Players in things. Visually, I dare say I was thrilled with this issue…everything looked good, ESPECIALLY a lot of the Magneto and Bishop stuff. Whatever nitpicks I might be able to find to cast some negative are easily overshadowed by the issue’s opening and the depiction of Magneto. As I’ve said in other reviews across the AoA stuff…this is where Magneto came to really be one of my favorite comic characters…and this version of him is easily my favorite depiction OF the character. One almost needn’t have read the first couple issues to follow things here–technically those stand alone, apart, serving as our point of witnessing what the characters went through where in this issue we’re simply told THAT they helped with the evacuation of the humans. 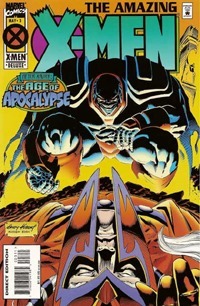 Magneto being attacked, and both he and Bishop being taken by Apocalypse cues the final stage of the Age of Apocalypse, as concepts and potentialities solidify and larger pieces of things are visibly coming together, everything being drawn toward Apocalypse himself at the heart of his empire. Having so enjoyed this issue, I truly don’t relish forcing myself through (m)any other issues and I’m simply eager to get to the final issue of Astonishing X-Men, and of this title, and then on into X-Men: Omega…though there are a number of other issues yet to go before the finale of this story. We open on a prologue of sorts, witnessing Abyss torturing someone to maximize his own enjoyment of feeding off the kid’s life force. Then we turn back to the X-Men who now face foes who have commandeered the re-wiring of the Sentinels…now instead of being "invisible" to the sentinels, the X-Men are included as targets…a challenge they must overcome in order to be at all effective in helping the humans escape. They also learn that Abyss is holding this boy hostage, and Quicksilver and Storm go after him to save the kid. Meanwhile, Apocalypse determines that he Has Had Enough Of This and prepares to attack Magneto directly. Like the first issue, this one is something rather different than I thought I remembered…something that might yet be attributable to cover images that I’ve seen repeatedly through the years while not re-reading the contents for years. 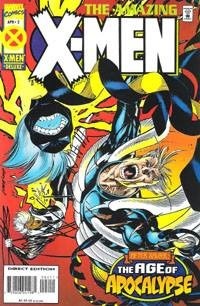 This issue’s cover…while showing Storm and Quicksilver battling Abyss seems a bit stylistic, particularly in Abyss’ appearance as well as Quicksilver’s silent scream. A coworker asked me about part of it–if Storm was shooting lightning, and I realized that hadn’t even registered to me visually…just a bunch of color and lines. The story is solid and enjoyable enough (given the dark setting and subject matter). It’s interesting to see the possible romantic relationship between Storm and Quicksilver simmering just under things, and at the least the relationship the characters DO have as-is. Somehow I’ve associated this title more with Rogue and her group than with Storm and Quicksilver, yet at least as of these first two issues, it’s definitely a Storm/Quicksilver-led group…though I believe the focus shifts a bit for the back half of the series. The art is good, and no real complaints from me there outside of my note above on the cover. Even that isn’t horrible and is more of a "noticed" thing than anything drawing me out of the story or distracting or such. Nearly halfway through the Age of Apocalypse now, and it seems like the journey’s just begun. Though I’ve not cared much for the "10 years later" stuff through present done with "advancing" the world…I still feel there is an incredible amount of potential for these characters and stories to be told prior to where we picked up in X-Men: Alpha. And that’s probably part of why I find myself drawn more to Amazing and Astonishing X-Men to the self-inflicted quasi-dread of reading some of the other titles. This book holds as one of the "treats" of the bunch, though. This issue is one of THE iconic issues of my youth. I’ve read and reread the issue countless times. It sticks in my head, and is one of the key issues I think of when considering X-Men stories. The cover image is iconic, as is the silver-ink coloring on the cover (shockingly enough in a way, there’s no foil to the cover.) I have a number of copies of this issue in my collection, as I often buy it from quarter bins for the nostalgic factor. And if only "mentally," the cover combined with my recollection of the issue really lends a bit of finality to the thing, like this really could be a "final issue." (Perhaps that’s also helped by the fact that Marvel doesn’t seem to like any of their titles getting much past 30 these days). We open this issue with the four time-lost X-Men staring in disbelief at the scene that surrounds them–of Legion and Magneto trading blows in the skies over Haifa, their memories having finally returned (for all the good it does them). They seek out young Xavier, and take turns taking on Legion themselves, before Iceman finally manages to freeze him solid. Meanwhile, in the present, everyone comes to accept that despite their best efforts–of the several X-Men "tagging along" to the past as well as the attempt with Cable to contact them–they’ve failed and the finality of their universe rapidly approaches. In the past, things come to a head as Legion pounces on Magneto, planning to kill him with a psionic blade…but young Xavier throws himself at them, and is the one killed. But with a dead Xavier, there never would be a David Haller. No David Haller means no X-Men-in-the-past. For that matter, no X-Men. No X-Men, no world where the X-Men have been around to save it umpteen times. Etc. Reality ends. With only moments to react, everyone faces the crystallization wave, taking their final moments in their own ways. I’d forgotten or not really noticed before how much the art of this issue was broken up. I REMEMBER it as a cohesive whole…and this time through, even, just reading through, I didn’t consciously note any particular "breaks" in one penciler over the other. I just kept right on going, and would actually have to go back through very specifically to pick out which pages were by which team. Which is the way it SHOULD be, for this sort of thing. Garney and Kubert certainly complement each other with a similar enough style–whether one veered toward the other or not, I don’t know. That goes into the story side as well…namely, that this was such a monumental thing for me back in the day, that even reading it now, it simply IS. I flew through the reading, remembering all these little parts as I went along, as I came to them. Yet the art never jumped out at me or turned me off for anything…it was just there, consistent enough that it definitely worked for me. Huge as this issue is for what happens, it’s a quick read, and reeks of a foregone conclusion. The cover itself proclaims To All Things–An ENDING!" 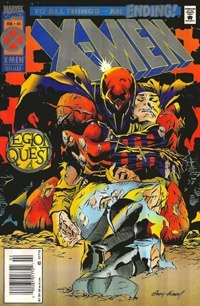 and we see a beaten Magneto holding the body of Xavier (not entirely accurate as Erik wasn’t yet Magneto and all that, but the cover gets plenty across symbolically with the costume’s presence). The issue’s narration is particularly poignant to me even if it is a bit heavy on the "telling instead of showing" thing. By the final couple pages we see bits showing how fully in-continuity this is for the X-Books (though it didn’t affect the non-X books of the time). 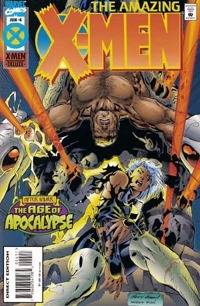 It strikes me that for a contemporary comic of this magnitude, this would have been a foil-enhanced cover for sure, probably $4.99 to $5.99 and a Very Big Deal despite "only" ending the "prologue" to the main event it’s setting up: the massive Age of Apocalypse, with the entirety of the X-books going on hiatus for a third of the year, replaced by four-issue mini-series on a one-for-one basis. This issue ends Legion Quest, and as an ending to that story, and as an issue taken by itself, it works well for me. With modern comics it seems like story endings are merely backdoor prologues for the Next Big Event. While, yes, this "leads into" Age of Apocalypse in general, the issue itself ends, with finality. 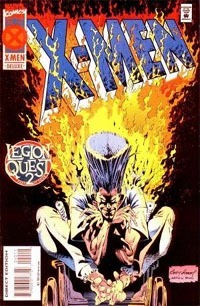 Legion Quest is the story of Legion going back in time to kill Magneto, with several X-Men hitching a ride back to stop him, while the rest gather and try to "help" as they can from present-day…but as a whole, the entire thing fails–including Legion himself…which ends their reality. So far as we see and "know" within the story, everything ends. No broken timestream–just an ending. No revelation of some alternate timeline, no popping-in of some hero from another timeline to save things at the last second, no deux ex machina resolving things in the final panel, no crap ending to an otherwise decent story…this could very well have simply been THE end. And for the kid I was, this was exciting stuff, and took me "all in" for Age of Apocalypse, and combined with Superman and Batman stuff in the couple years prior made for a massive touchstone in my experiences as a comics reader that holds over into the present. As my rambling on this issue shows…I’m hardly unbiased, and have loads of thoughts and memories associated with this. But having now covered this issue…next week, I look at X-Men: Alpha and then on into the Age of Apocalypse itself! Having responded to Jean’s distress, the other X-Men squad scours the desert for their missing teammates. On locating Jean but not the rest of the group, they rush her back to the temporary HQ, where she awakes and tells them about Legion. Meanwhile, in the past, the time-lost X-folks have no memory of who they are or what they’re doing in the past. Several weeks have passed for them, and they’re beginning to regain some memories, just not the key ones. Also in the past, Xavier and Magneto continue to interact as we see the growing friendship, as well as Xavier’s romance with Gabrielle Haller. Erik deals with an anonymous patient who unlocks painful memories. In the present, Cable and Domino arrive, and while they’re assessing things, a cosmic projection from Lilandra of the Shi’ar brings tidings of doom to the heroes of Earth…information authenticated by presence of numerous Watchers. Going through this issue, I’ve realized that Andy Kubert is–alongside if not moreso than Jim Lee–probably my favorite X-Men artist. I love the looks of the characters in this issue, the layouts, etc. I normally don’t notice the art like this, but it hit me here, and actually added to my enjoyment of the issue. The story’s not bad. While I’m reading these for the first time in years and without the context I’d had when I originally read them, I’m also noticing a similarity in the books that is quite pleasant–where I probably honestly would not be able to tell you for sure who did what issue’s story(ies) between this and Uncanny X-Men withOUT the credit boxes. There’s a two-page “interlude” in this issue that addresses Wolverine’s absence (he left the X-Men after Fatal Attractions and from what I recall is just now returning to the mansion and the group)…and sets up his “final issue” for the next month. Almost a pointless bit, but well worthwhile all the same and fitting in the time of touching on numerous plots and not keeping a tight internal story “just” for the eventual collected volume. I’d remembered the core of Legion Quest being four parts but couldn’t remember how it was broken down…with this issue, a lot of it came back…though I won’t elaborate here, as there are still several issues to cover. 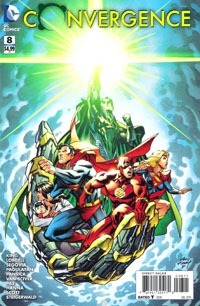 While truthfully I’d forgotten all about this issue’s cover image, having it brought back to mind it is rather iconic–showing Legion with the flames all around. It stood out quite a bit to me back in the day, but being a middle chapter of this story and such it just didn’t stick with me the way the final chapter did. The issue doesn’t begin or end the story, just moves things along…but it was still very much a treat to re-read, and continues drawing me back in time myself, 20 years, to when I was a kid reading these for the first time…when the story was current and unfolding and not essentially a footnote in the history of the X-Men.